VTE-LPG and LPG-HAN. First flight delayed 40 minutes due weather but second left and arrived early. A320 was immaculate inside and still felt new. Seats have video screens and phone connections. The ATR72 was comfy enough for a flight of just over an hour. During the short domestic flight a bottle of water and a small bun were served - adequate for such a short trip. On the flight to Hanoi the cabin staff handed out small boxes contain a filled roll slice of cake and a container of orange juice. Two rounds of drinks from the bar trolley were also offered. Given this is such a small airline with a limited network they did appear to try hard and I was favourably impressed. 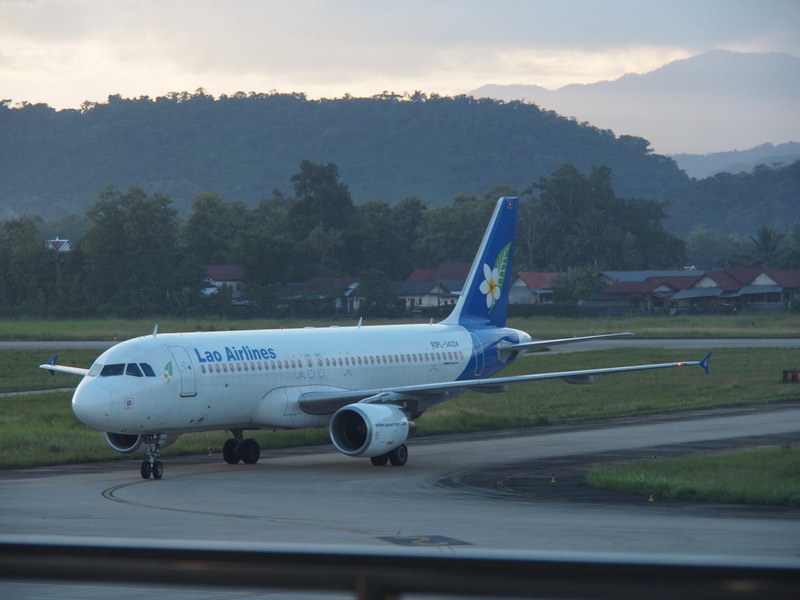 I have flown Lao Airlines dozens of times over the past 5 years and have seen a real effort to modernize the fleet and provide quality service. There are many new ATR-72's as well as a couple of new A320's. A snack and a cold drink are offered on all flights and I've never had a problem. My only negative feeling is that they are now flying the A320's on the VTE-HAN route and it takes away many good memories and nostalgia of making the route some many times in the ATR. 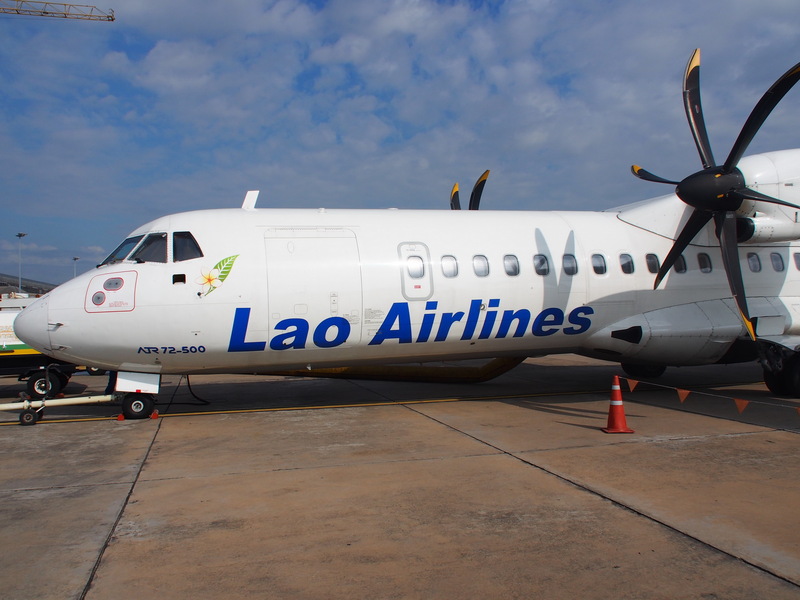 We flew from Vientiane to Pakse. The flight left and arrived on time. The plane was cramped beyond belief. Only one carry-on bag fitted overhead. The other sat between us because it would not fit under the seat either. First time that has ever happened. Service was ok but the whole cabin was incredibly small - and on a full flight which ours was - that meant uncomfortable. If I ever fly this airline again I'll check that I am not flying on an MA60. Pakse-Luang Prabang. We arrived at the airport 2 hours before the flight. As we were travelling in a small group (8) it took 30 minutes to get everyone checked in. As I was just about to do some last minute airport shopping we were called to go through security then immediately onto plane! The plane departed 1 hour early and had a total of 14 passengers all tourists by the look of them. If only all flights could be this easy it would be brilliant! Flight was smooth and inflight meal edible. PKZ-VTE on the ATR72 aircraft was in good condition. Seats may get cramped for taller people. Food and drink were served including a chicken loaf sandwich a piece of cake and three pieces of fruit. The whole experience was pretty smooth check in was easy bags were quickly transported to the terminal. Only bad spot as the steep airfares but that's the case in general with the airline. SIN-VTE return. Brand new plane (same plane both ways). Adequate legroom. Decent meal served. Flight attendants have a tendency to chat to each other while serving. In-seat PTVs but no headphones were given out so bring your own (2-pin) earphones. Both flights were on time. 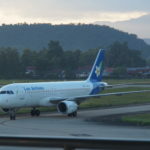 Xieng Khuan/Phonsavan to VTE and VTE-BKK. Both flights on ATR 72. Typical ATR72 seating but plane has a few "Business class" seats in the back. Although not much difference we were happy to be given those seats on the VTE-BKK leg without asking due to short connecting time in BKK. FA's on both sectors very friendly. They assist by offering to take bigger hand luggage and store it at the back and this was available right after disembarkation. Snacks served very nice and drinks offered as well. Was surprised to have someone waiting in BKK with our names that escorted us to the Thai transfer desk. SIN-VTE return. 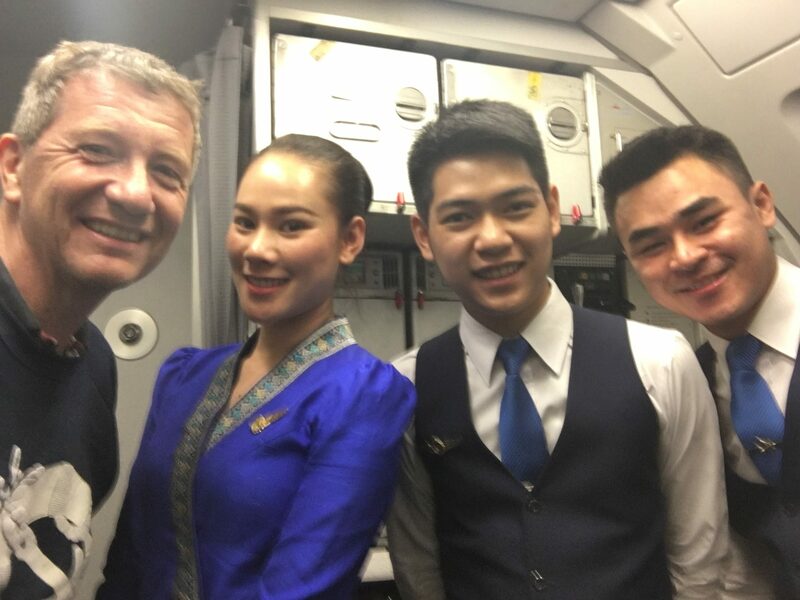 Lucky to have taken brand new aircraft on both flights. Sat at Rows 5 and 6 (the first 2 rows) of economy class and it was very spacious and comfortable with adjustable head rests and IVOD. The emergency exit rows were more spacious (rows 9 and 10). During take off and landing the cabin lights dimmed and turned blue. Easily the best A320 I have taken out of and into SIN. Food was normal and cabin crew service was good. Toilets were well maintained. 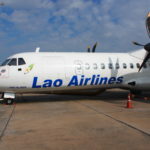 Chiang Mai-Luang Prabang. Flight departed on time. Smooth ride for a prop-jet. Served an odd but somewhat tasty snack on the short flight. Back of plane appears to be Economy as there was an undrawn curtain between areas and the seats in the back are cloth instead of leather. Otherwise the seat size and pitch are exactly the same in both areas. Economy seats exit the plane first so it's difficult to see the advantage of business seating (if that's what it was.) 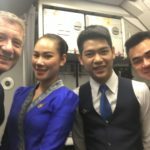 Friendly efficient flight attendants able to whip out meal and beverage service on a 30 mins flight. Luang Prabang-Vientiane. Lot's of problems trying to use my foreign cards on their website. Super little airline with a modern fleet. Because it's Laos don't expect them to run to a strict timetable. They'll quite happily hold a flight (in my case for nearly 2 hours) waiting for late connecting flights to arrive and allowing those passengers to make their connections. It's a good consideration for the 5 or 10 passengers connecting and a minor inconvenience for the 40 waiting in the lounge.